C-Class: Cammas wins 'Little Americas Cup' in preparation for the Big one. All Images Cammas-Groupama - Franck Cammas & Louis Viat dominated the entire event including the final Matc Race against Hydros Billy Besson & Jeremy Lagarigue , who suffer a tremendous hard pitch coming from mid air, and showing how hard a foiling down punch can be. Basically what I did expect Oracle to suffer in the AC final on their previous unstable foiling. 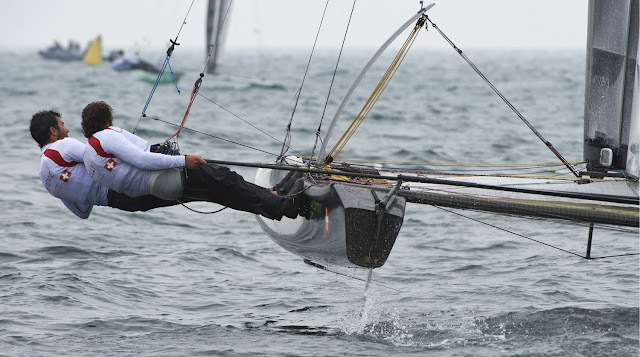 But as we know they ended redefining stable flught down & upwind. On the Cs Cammas had the advantage of testing flights with the Flying Phantom platform, confirming one more time that testing in scaled / similar platforms it is a must beyond what your CFD numbers are saying. The most interesting aspect of this C-Class Little Americas Cup edition was not the perfect stable up/downwind foiling for Cammas and superior downwind speed for Hydros, but how Groupama C performed in 5 knots against some well proven displacement Cs. Some say endplate, canting Mast, thinner foil sections for their Wing I say foils & hull were key too. Groupama C it is TNZ Tractor scaled hull, and they also went for a more conservative approach, Hydros had more active settings (manual..) which translated in more speed but was more tricky to handle. Groupama relegate some final speed to have a stable ride, just like the Kiwis. What we´ve seen in at Falmouth is exactly what happened at SF until that 8-1, after that OR ruined NZ party and all our previous analysis to that point in time! But I still would choose NZ platform again any day, as OR low Aero&Hydro drag features weren´t useful and prone to disaster until they changed trim, or whatever they have possibly modified beyond handling and tactics , to achieve that extreme speed gain. Thus the Aero&Hydro advantage only came into play when they solved how to stabilize the flight upwind, till that moment even in upwind floating mode NZ was superior. And IF Oracle just modified their strategy to sail wider angles to maximize speed resulting in better VMG as reported by Coutts to be their major improvement asset, then NZ platform can be used too to reach an 4-6knots improvement, in say 2-3 day testing & development, don´t you think?? Remember Oracle also struggled bad time in calm weather and was minutes from losing the Cup in those conditions to NZ Tractor, Groupama also had in this event a wider range than the rest of its competitors including of course the Hydros boats that had tough times in the calm, but were faster once foiling , just like OR. All in all, for the 5-25knot wind race target NZ & Groupama design choices are proven to be all around. Great work done from Hydros too, assembling two boats with 4 of the most talented sailors you can get. In 3 years we will see some great racing in Swiss lakes for another edition of the now literally Little Americas Cup. Events and developments are gathering in the corner for Adam May's interview since the early AC45 Artemis flight... Adam was present at Falmouth where he left the design aspect to go racing. He also sent me this image of Hydros pitch. Later feedback from Mike Drummond, Adam May, Alex Udin, Arno Terra & Gonzalo Redondo on the Cup & Cs. Plus Flying Phantom OD launch. Next post a detailed sequence & video of this pitch. Results & updates/reports from Falmouth pending.